Authoritative, detailed guides to the things you're curious about. 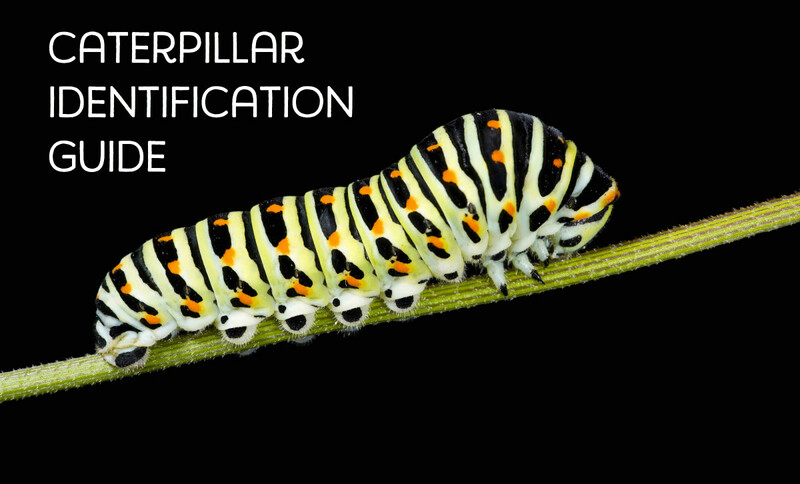 If you have been gardening and you came across a caterpillar, this guide will help you identify it. In addition to identification, you may need to know more about the insect -- for example, does it sting? Is it toxic to pets? Is it likely to do serious damage to your garden plants? 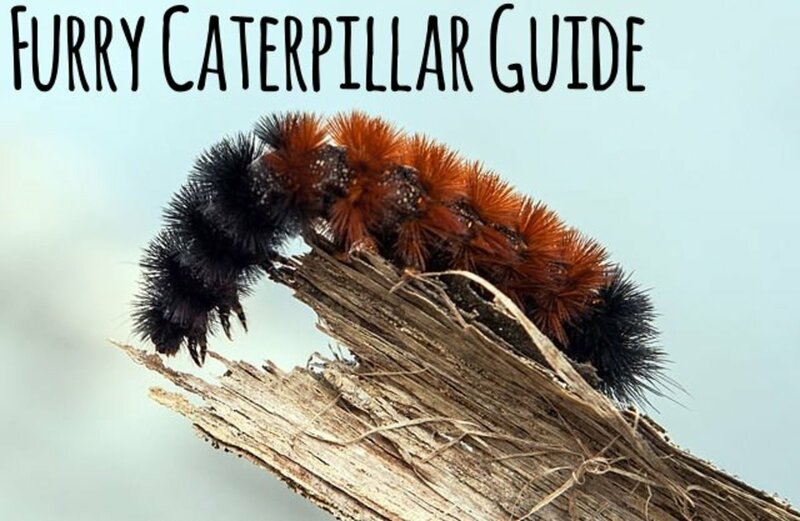 This garden caterpillar guide will offer answers to these questions as well. Will it seriously damage your garden? What does it turn into? Can you raise it to an adult? If you still have questions about identifying the caterpillar you found, there are good internet sources that are species-specific and can give you more detail. 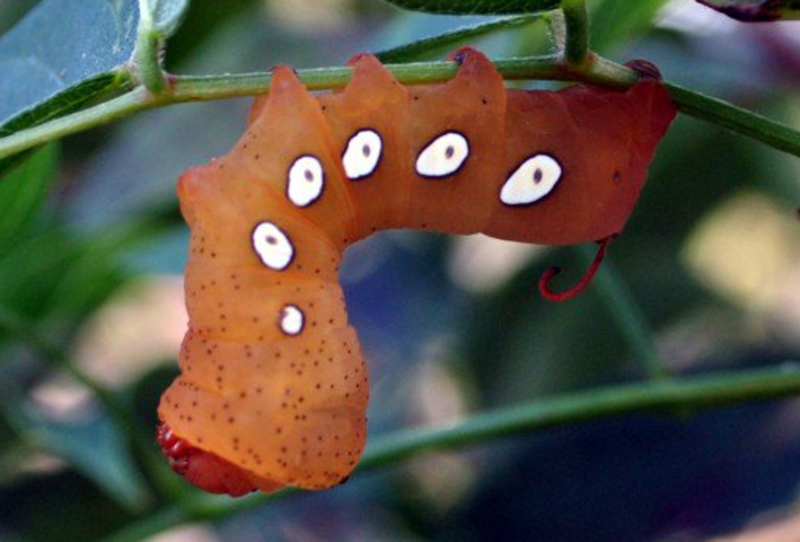 Caterpillars are the larval stage of Lepidoptera, commonly known as butterflies and moths. They spend their days eating and storing energy for the adult butterfly or moth that they will become. Caterpillars are well-adapted to their natural surroundings. Most of them are camouflaged, so even though they're all around us, we never see most of them. They are so perfectly disguised, or have such secretive habits, that we walk right by them without ever knowing they're there. But they are! 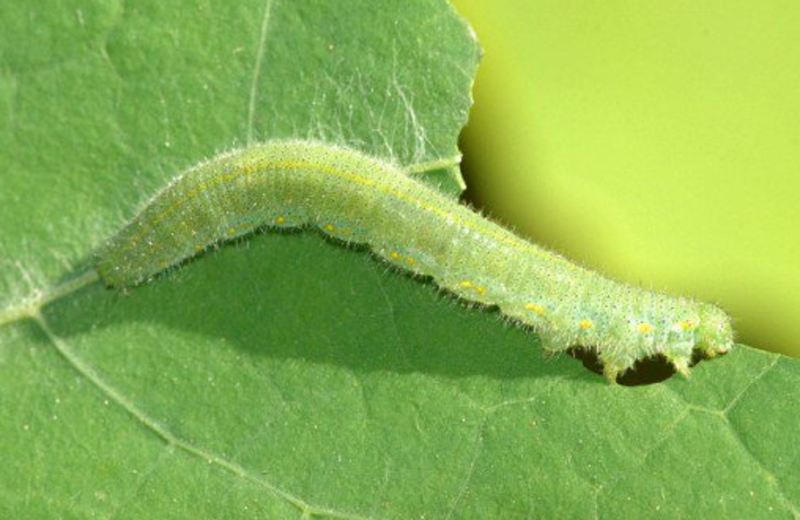 Most caterpillars live their lives quietly eating leaves (and, of course, pooping). They rarely do any damage to the plant they live on. 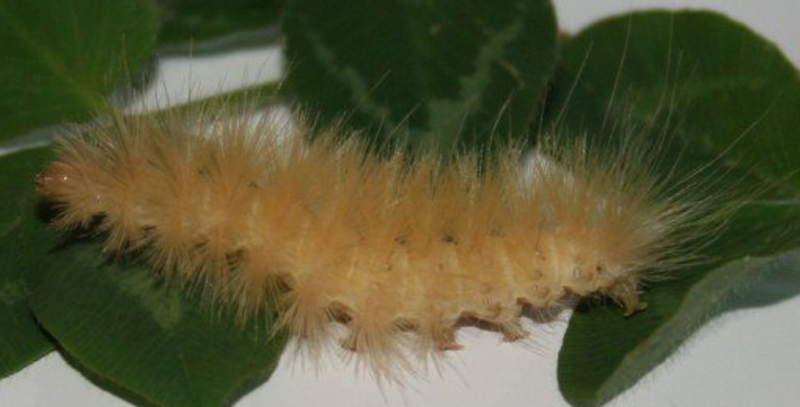 Sometimes, however, caterpillars can seriously harm trees and other plants. 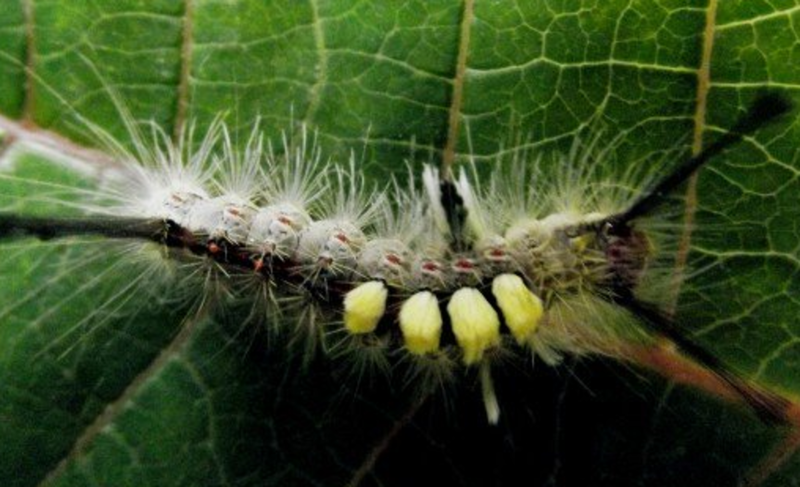 The gypsy moth caterpillar is a serious pest of oak forests in the northern US. Other caterpillars attack garden plants. 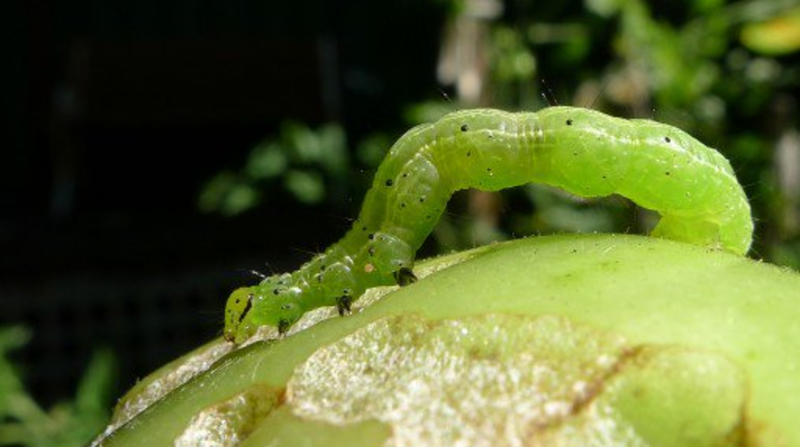 If you grow tomatoes, chances are good you've come across the Tomato Hornworm, a big green monster that can destroy a tomato plant in less than a week. This caterpillar looks a lot like the monarch caterpillar -- and that may not be an accident. The monarch is most likely "protected" by the bitter sap of the milkweed plant that it eats because some of the toxic compounds in the sap become incorporated into the insect's tissues. 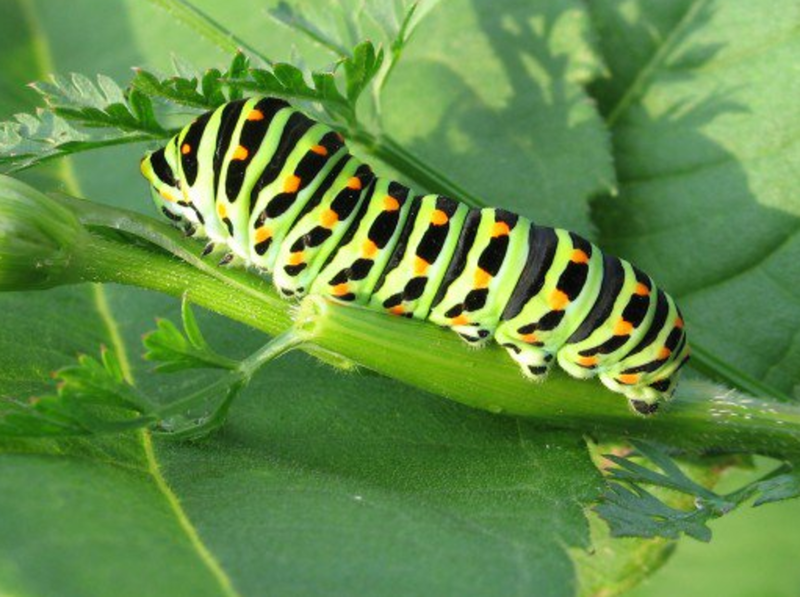 The black swallowtail caterpillar eats the leaves of carrots and other Umbelliferae species, which gives them little protection. But sometimes just looking like you're poisonous can be protection enough -- that's the basis of one major form of mimicry. It's thought that the black swallowtail caterpillar mimics the monarch caterpillar so birds and other predators might leave it alone, putting a mistaken identity to good use! These caterpillars can be kept in a safe, unbreakable habitat designed for raising caterpillars. Make sure you give them plenty of the host plant—for this species, carrot or dill—that you found them on. 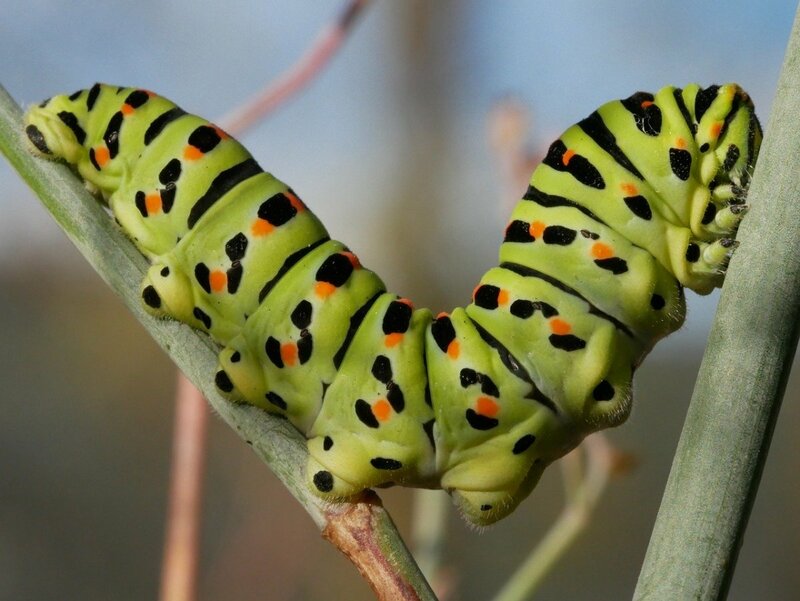 This attractive caterpillar turns into a beautiful, big butterfly known as the black swallowtail. Will it seriously damage plants or trees? Sometimes they can eat a lot of carrot greens. What does it turn into? 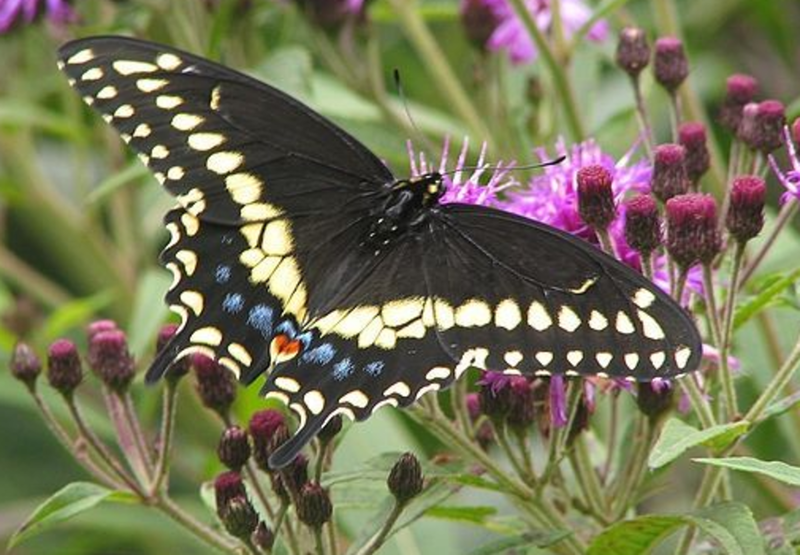 The gorgeous black swallowtail butterfly. Can you raise it to an adult? Yes, if you give it an upright stick to pupate on. These little guys are often seen hot-footing it across the road in rural areas of eastern North America. They belong to the family of tiger moths (Arctiidae), which includes many attractive and widespread species. 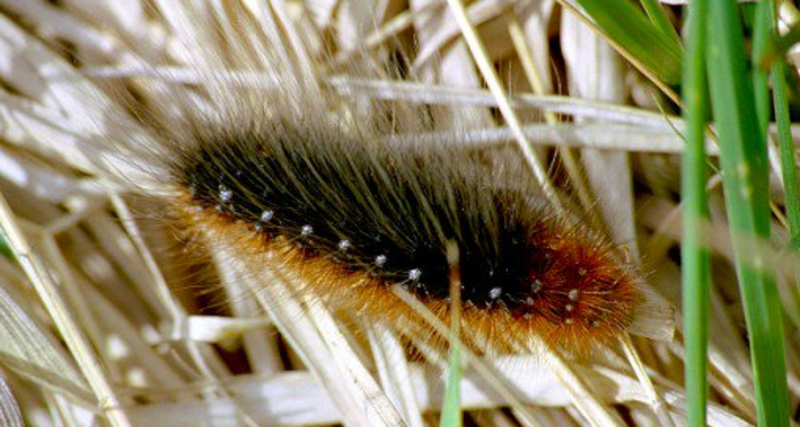 Woolly bears are the larva of the Isabella tiger moth, Pyrrharctia isabella, and they feed on a number of common plants found in second-growth areas and roadsides. When you see them hustling across the road, they are looking for a good place to spend the winter; this species hibernates under rocks or logs, emerging in the spring to pupate. The moths emerge in early summer. Does it sting? No, although the fur can be irritating to sensitive skin. What does it eat? Just about anything, from oak trees to dandelions. Will it seriously damage plants or trees? No. What does it turn into? 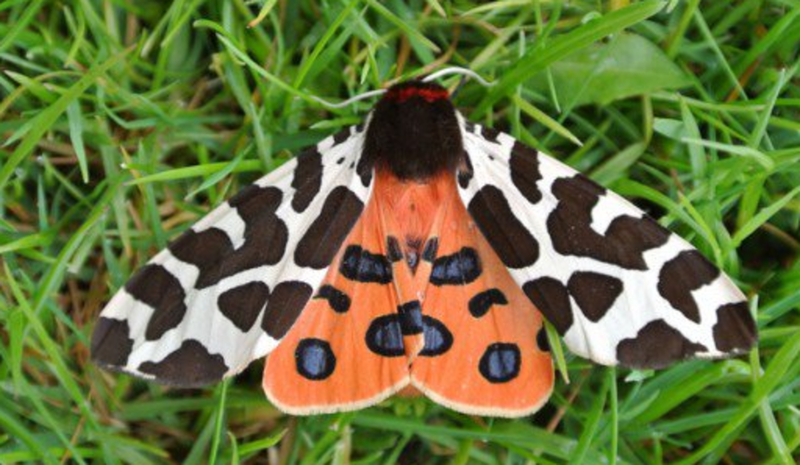 A very pretty but seldom-seen moth. Can you raise it to an adult? Not easily, since it overwinters as an adult and needs a pretty specific environment. This is one of the most commonly encountered of all North American caterpillars. They eat a wide variety of common plants, many of them considered weeds, and they make no real effort to hide -- you can often find them on the top of a leaf in the middle of the day, happily eating. They are typically pale yellow or orange, but some individuals are much darker. The fur is thick but not spiny, and they are very "firendly" -- they don't seem to mind being handled and will harmlessly crawl over your hands (some people with super-sensitive skin may have a mild reaction to the fur). 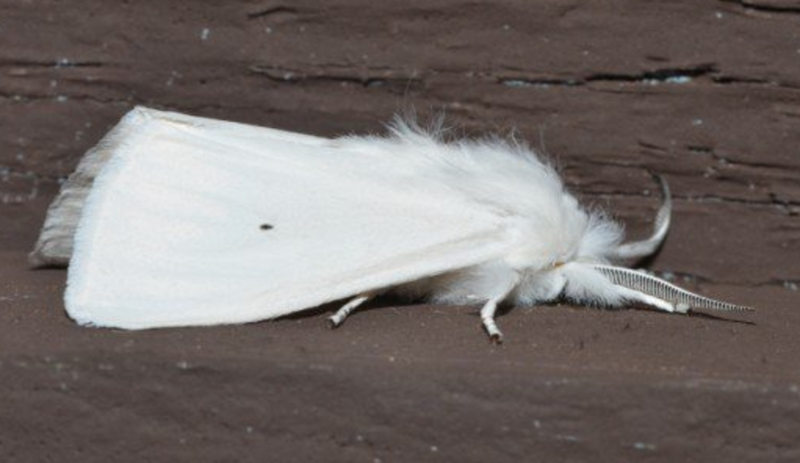 The adult is a beautiful white moth that you may find in the summer around your porch lights. What does it eat? Mostly low plants and "weeds." What does it turn into? A very pretty white moth. Can you raise it to an adult? Yes. 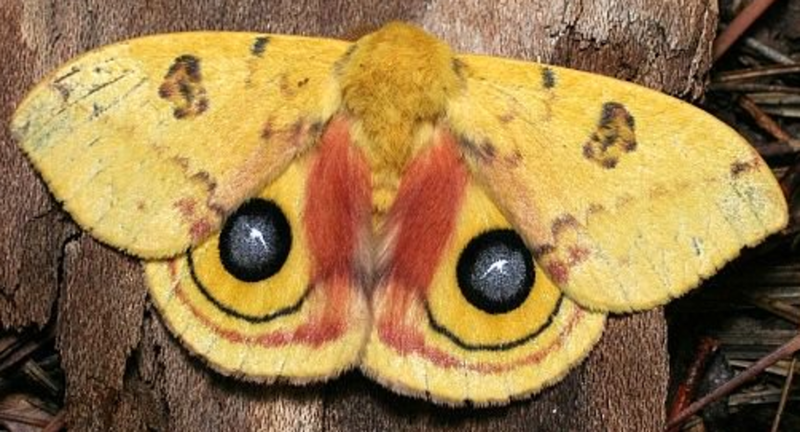 This species, Automeris io, belongs to the group of giant silk moths that also includes the cecropia and polyphemus moths. This is one of the few caterpillars in our area that has irritating spines for protection, which really interested me when I was a kid. I had read all about the animal's "stinging spines" in my trusty Golden Nature Guide. I found one when I was about twelve and brushed the spines against my arm on purpose to see what all the fuss was about. Did it sting? Yes! This beautiful caterpillar turns into a beautiful moth. The false eye-spots on the hind wing are very realistic, and come complete with reflected-light markings, making them extra realistic. Does it sting? YES. This species is protected with venomous spines. What does it eat? Many plants, including roses and other garden plants. Will it seriously damage plants or trees? Not usually an issue. What does it turn into? The striking io giant silk moth. Can you raise it to an adult? Not advised. 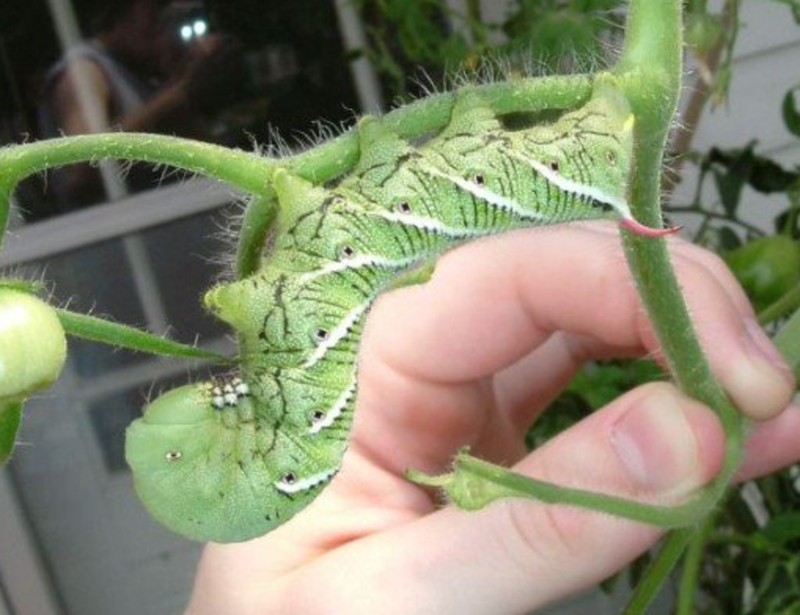 These huge caterpillars can often be found chowing down on your tomato plants, often to the point where the entire plant is eaten. 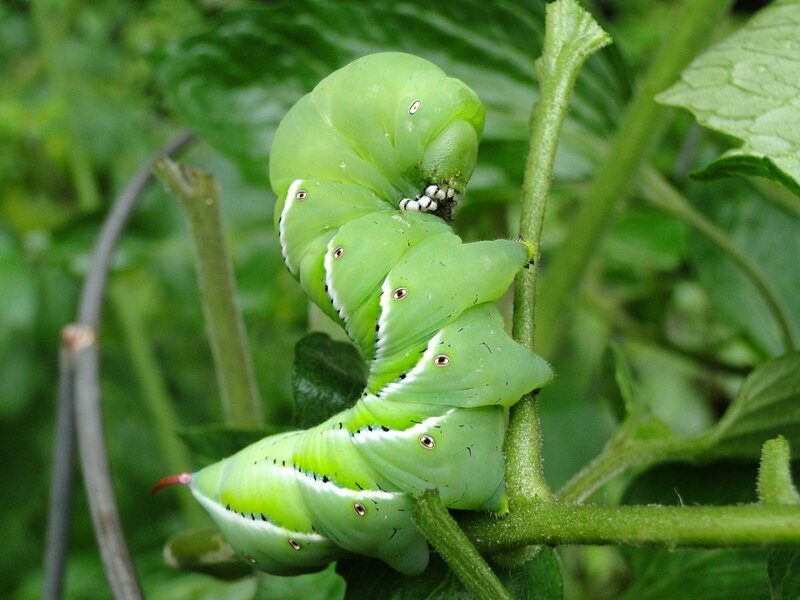 The tobacco and tomato hornworms are very similar and often eat both plants, as well as sweet potatoes and other crops. 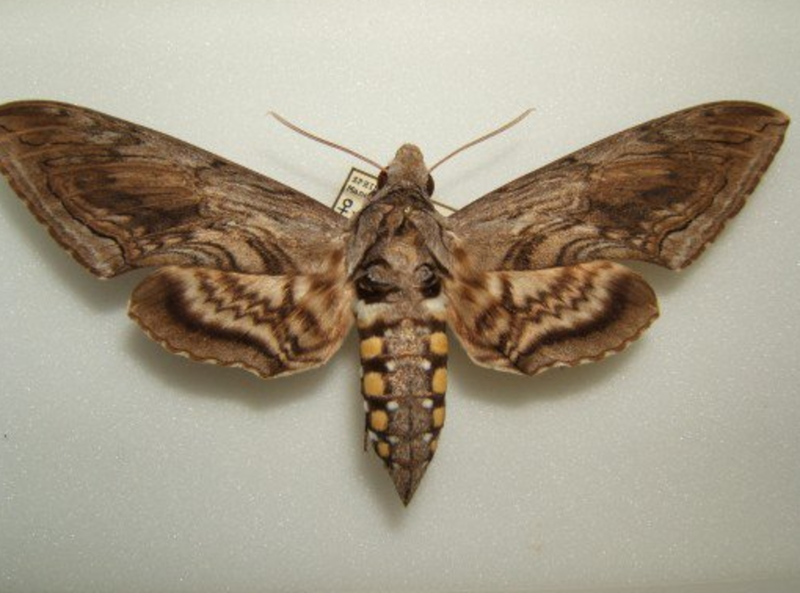 They produce similar moths: huge brown bombers that are such good fliers they have earned the nickname "hawk moths." Does it sting? No. The horn on the tail end appears to be only for show. What does it eat? Tomatoes, tobacco, and many other plants. Will it seriously damage plants or trees? Yes -- this species can be a serious pest. Is it rare? No, very common, even in cities. What does it turn into? A big strong moth known as a "hawk moth." Can you raise it to an adult? Yes, without much difficulty. I am often asked about killing caterpillars that are destroying garden plants. I myself prefer to pick them off by hand and smash them into my compost pile, but sometimes that's not practical. On occasion I will use a product called DIATOMACEOUS EARTH. Diatomaceous Earth kills pest insects and is safe for the environment -- in fact, it's one of the more common substances found in nature. The way it works is pretty mind-blowing. Diatomaceous Earth is refined from dirt found in the bottom of old ocean, lake and stream beds. It's full of the fossilized exo-skeletons of microscopic animals called diatoms. The skeletons of these animals are made out of silica, the same basic component of sand (and the silicon that supplies Silicon Valley with material for all of our computer chips). Here's where it gets interesting. Diatomaceous Earth is not toxic, and is not a poison -- it kills insects because when they crawl over it, the jagged silica shells left behind by the diatoms make little scratches and cuts on the insect's underside. This damage is typically fatal. Diatomaceous Earth is considered safe for humans, and much of it is "food grade" and actually offered as a dietary supplement. I avoid breathing it, but that's not too difficult since you're typically outside when you apply it. All things considered, this product is the thing you want when you have an out-of-control caterpillar problem. Natural Product - Composed of 10lbs of 100% ground freshwater diatomaceous earth with absolutely no additives or fillers. OMRI Listed - Listed with the Organic Minerals Research Institute, a non-profit organization that reviews products against organic standards. Hundreds of Uses - Mother nature's best kept secret with hundreds of uses. We encourage you to explore the many benefits of food grade diatomaceous earth! Supports a Great Cause - Harris donates 10% of profits to support the local Etowah Valley Humane Society. This cool-looking little guy is the larval stage of the tiger moth Euchaetes egle. There are relatively few Lepidoptera species that feed on milkweed, which has poisonous sap that may make the caterpillars themselves poisonous to birds. Like the monarch, milkweed tiger moth caterpillars eat nothing but milkweed and spend all of their time on the plant, living and moving in small groups of up to ten. They're not at all hard to find on the host plant -- their bright coloring is thought to be a kind of warning to predators not to even bother eating them. For such a showy caterpillar, the adult milkweed tiger moth is pretty plain -- unmarked, light gray wings with a spotted abdomen. Does it sting? No, but the fur may be irritating. What does it eat? Milkweeds. Will it seriously damage plants or trees? Not usually, although it will eat a fair amount. What does it turn into? A very plain gray moth. Can you raise it to an adult? Not easily, since they occur in large groups and need lots of fresh milkweed. This bright orange beauty is one form of a somewhat common type of sphinx moth larva -- the other form is green, and while beautiful, is not quite as striking as this one. I've included this caterpillar mainly because I think it's so beautiful – as is the moth it turns into. This caterpillar in the illustration may be a tropical version of the North American pandorus species -- it's a little hard to tell. But if you find one, you can be sure you've found a truly special insect. What does it eat? Grape and virginia creeper, among other plants. Will it seriously damage plants or trees? Not usually. Is it rare? This species is not rare but it is seldom seen. What does it turn into? A truly gorgeous moth. 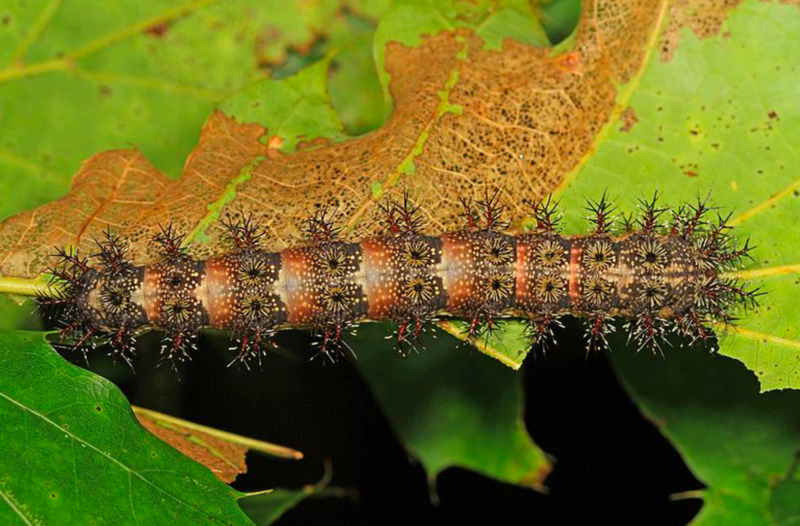 This caterpillar eats elm leaves and is known in some places as "the spiny elm caterpillar." It is the larval stage of one of the best-known butterflies in the world, the mourning cloak. 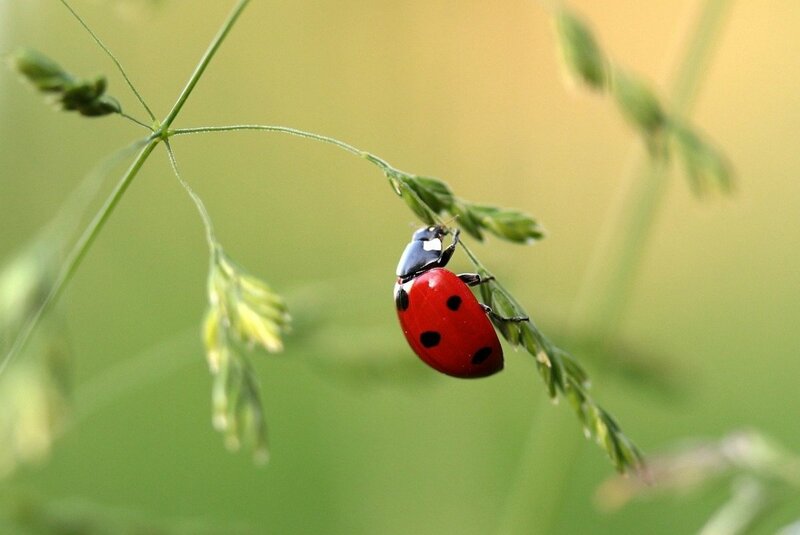 This beautiful insect is native to the US and Europe. In the UK, this species is incredibly rare, and entomologists can spend a lifetime waiting for one to show up (it's known as "the Camberwell Beauty" in England). 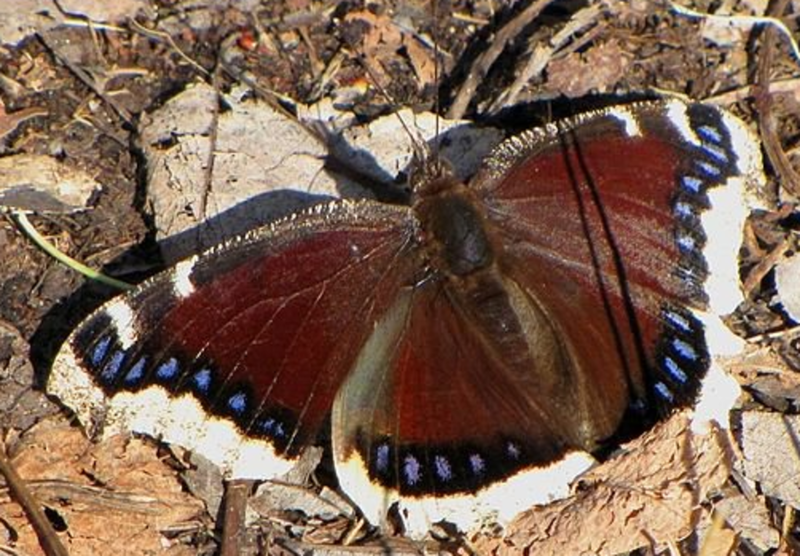 Up close, the upper side of the mourning cloak is gorgeous. The underside is considerably more drab; the dark colors give the insect its common name because early entomologists thought it looked like the drab cloaks worn by mourners at funerals. Mourning cloaks often winter in a shelter and begin flying on the first warm days of spring. Keep an eye out for these big, beautiful butterflies on warm spring days, even when there are still patches of snow on the ground. Does it sting? No, although the spines are sharp. What does it eat? Elm leaves. Can you raise it to an adult? Yes, if you give it plenty of fresh leaves. These cool-looking caterpillars produce a quite plain and inconspicuous moth. They eat almost anything, including some decorative trees like hawthorn that cities tend to plant along roads and in plazas. Tussock moth caterpillars get their name from the little tufts of fur along their backs; apparently these are called "tussocks" in some parts of the world. Does it sting? No, but it has stiff hairs that are irritating to some people. What does it eat? Many trees, including ornamentals planted in urban areas. Will it seriously damage plants or trees? Yes, it can be a real problem. What does it turn into? A small brown moth with a white mark on its wing. Can you raise it to an adult? Yes, quite easily. With its awesome pompadour and general slug-like build, this animal is sometimes referred to as the "Elvis Caterpillar." Puss moth caterpillars belong to the Megalopygidae family, which has a fair number of interesting-looking caterpillars. Many of these caterpillars have stinging hairs -- including the puss moth, which sometimes drops out of trees onto unlucky passersby! The sting of the puss moth is usually mild, though sensitive individuals can develop a more intense reaction. Megalopygidae moths are relatively uncommon, and if you see one you're lucky -- but don't touch! 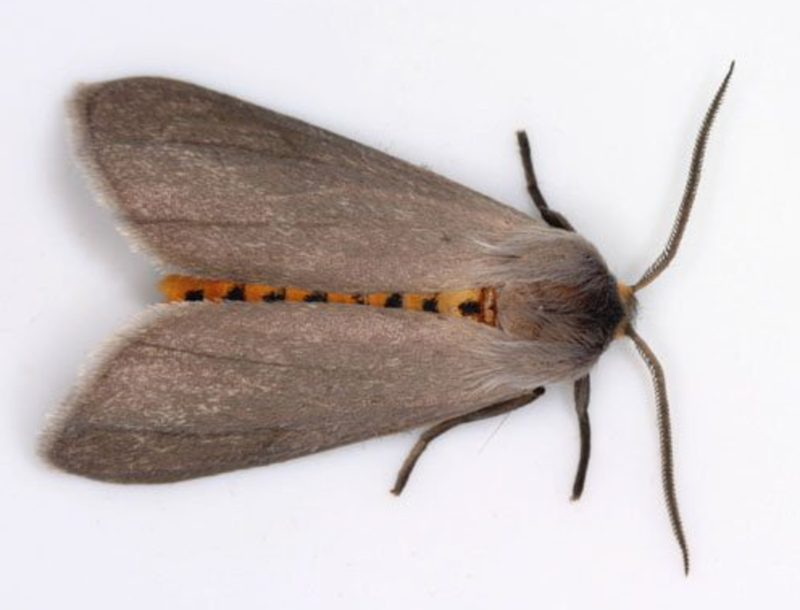 Nota bene: There's a moth in the UK called the Puss Moth, but it's in a different family (Notodontidae) and the caterpillars do not have stinging hairs. Does it sting? YES. 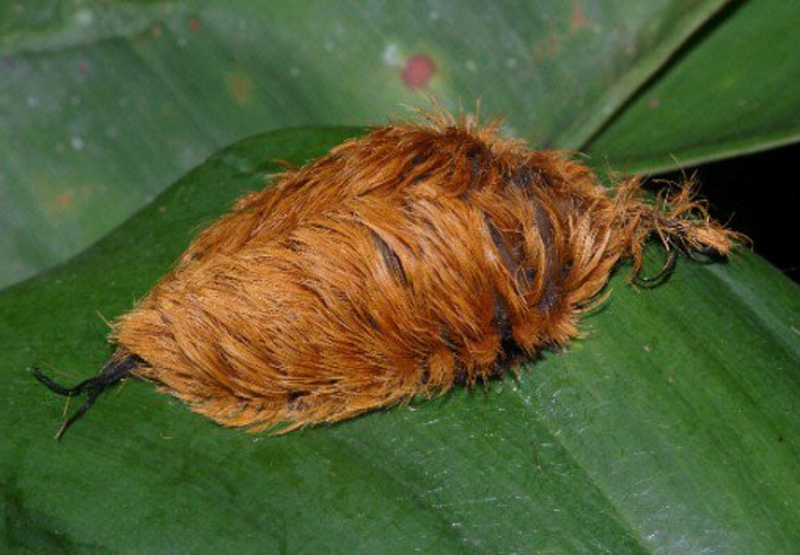 This caterpillar has one of the worst stings of any Lepidopteran. What does it eat? Oak, elm, and wild plum. What does it turn into? 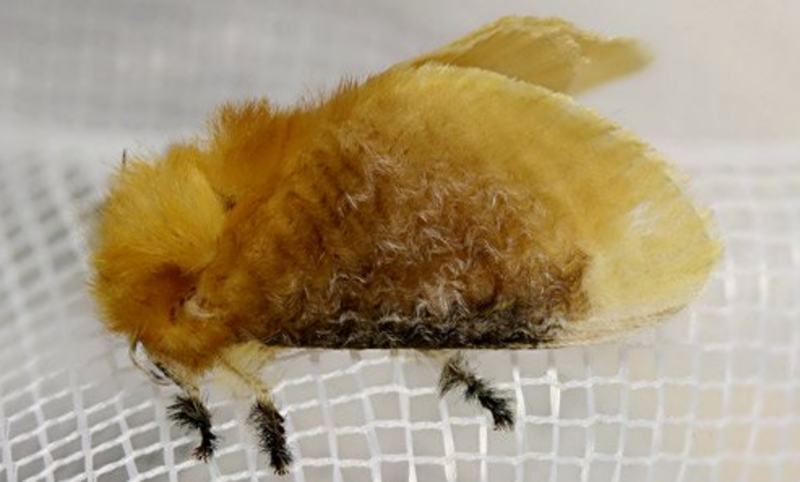 An interesting-looking insect called a "flannel moth." Can you raise it to an adult? Best not to try! The Genista broom moth caterpillar can be very destructive on some plants, especially to Baptisia species including the pea-like wild indigo plant. Genista caterpillars generally feed in groups. While they are rather small and slim individually, as a group they can eat a tremendous amount. 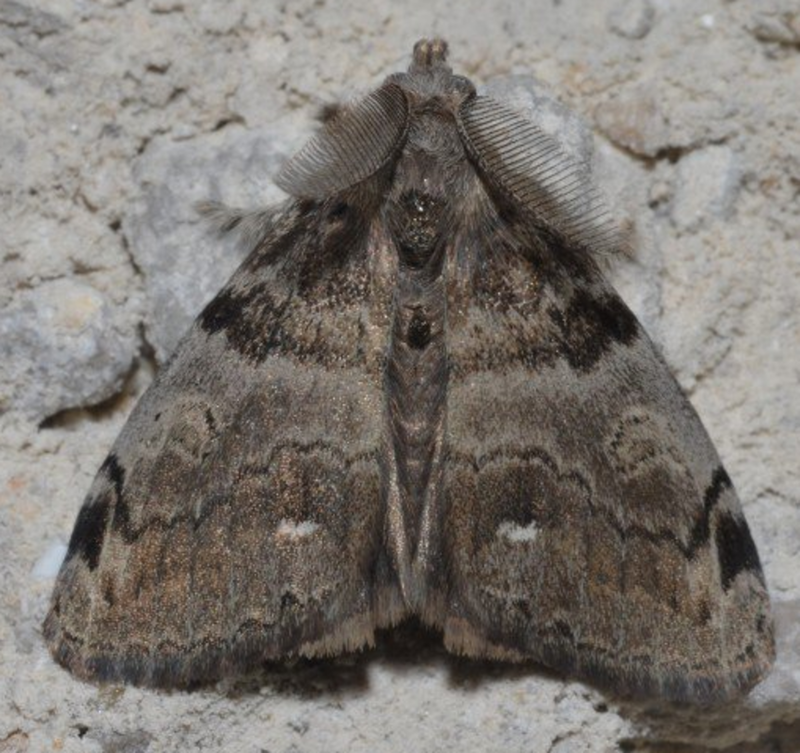 The moth is a nondescript brown insect in the subfamily Pyraustinae, which has hundreds of members that most people barely notice. What does it eat? Baptisia species. Will it seriously damage plants or trees? Yes. Since it feeds in groups, it can cause damage to plants. What does it turn into? A small brown moth. Can you raise it to an adult? Yes, if you really want to. You will likely never see the copper underwing adult moth, but you may find the caterpillar eating the leaves of many trees and shrubs, including apple, basswood, hawthorn, maple, oak, walnut, raspberry, and grape. This is a common species, but it's most often found as a caterpillar. The moth hides during the day in cracks and bark, so most people don't see it. Even if you do see the adult, the plain brown pattern on the upper wings will probably not catch your attention. The hindwings are a pretty copper color, hence the common name. 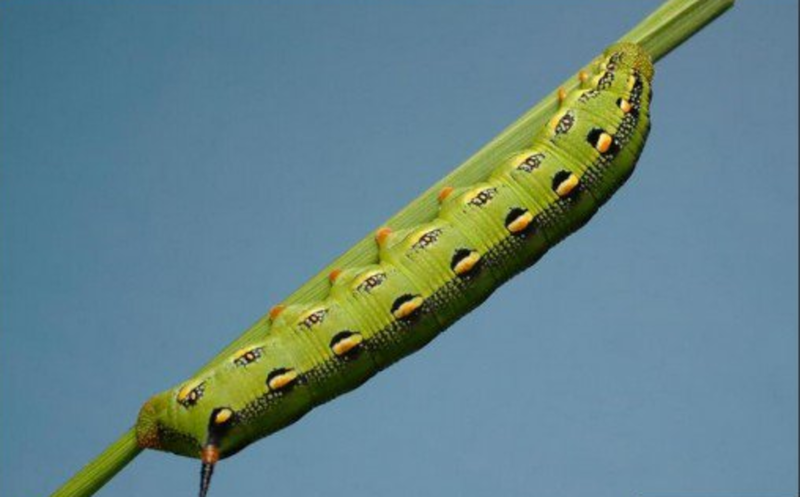 The big green caterpillar is sometimes mistaken for a hornworm, but it only has a hump, not a horn. In fact, this species gets its scientific name, Amphipyra pyramidoides, from its pyramid-like hump. What does it eat? Many trees and shrubs, including apple, basswood, hawthorn, maple, oak, walnut, raspberry, and grape. What does it turn into? A cool-looking brown moth. This species is related to the tomato hornworm. 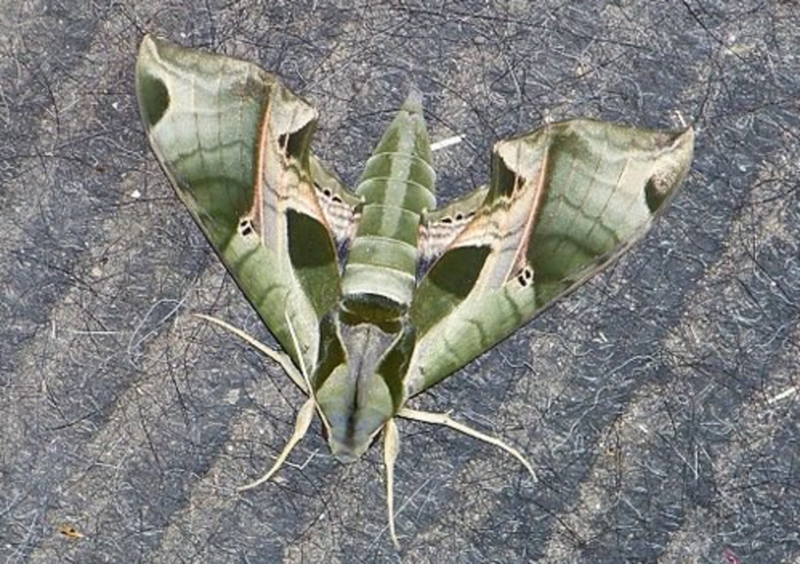 It is part of a large family of moths known as the Sphingidae, or hawk moths. The white-lined sphinx is a big moth that flies like a hummingbird, hovering in front of flowers to drink nectar through its long, flexible "tongue." 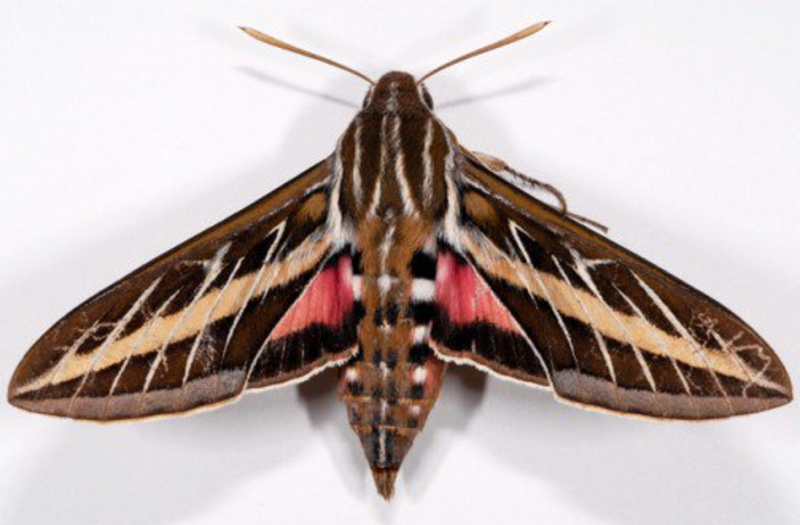 The adult is sometimes called the "striped morning hawkmoth," because its flies at dusk and dawn. If you're outside and it's getting dark and a big moth swoops by the hover in front of some flowers, it's almost certainly a hawkmoth of some kind. 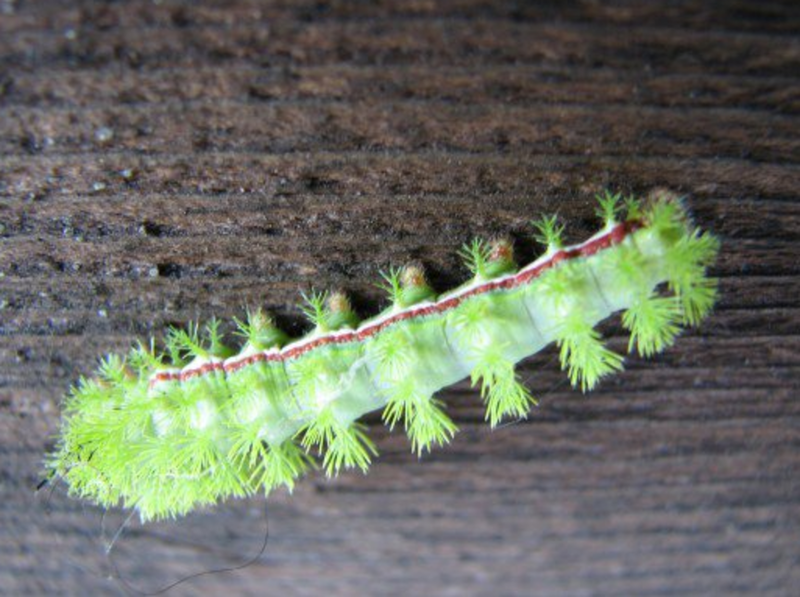 The caterpillars come in several forms: Some are green, as pictured, and some are brown are brightly patterned. Does it sting? No. The tail horn is only for show. What does it eat? Many trees and shrubs, including willow, apple, elm, primrose, grape, tomato, and fuschia. Will it seriously damage plants or trees? Yes, this species can occur in big numbers and can damage plants. What does it turn into? A big, beautiful hawk moth. This very common species is often one of the first butterflies you see on the wing in springtime. It's actually an invasive species, having spread to North America from Eurasia in the mid-19th century, but by now it just seems like a regular part of our fauna. The caterpillars eat almost anything and can be a serious pest of commercial and home agriculture. They are a soft green color that exactly matches the leaves they're eating, and they like to rest along the main vein of the leaf, where they're basically invisible. If you do find them, pick them off and drop them in soapy water. This species can be a real pest. Does it sting? No, the caterpillars are harmless. What does it eat? Cabbages and just about everything else..
Will it seriously damage plants or trees? Yes, this species can eat holes in many garden plants. What does it turn into? 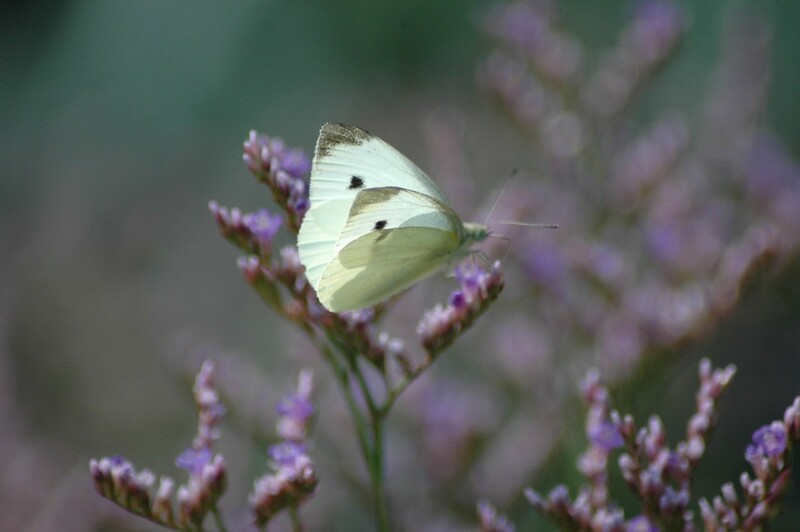 The very common "cabbage white" butterfly. This is another very common garden pest on cabbage and other plants. 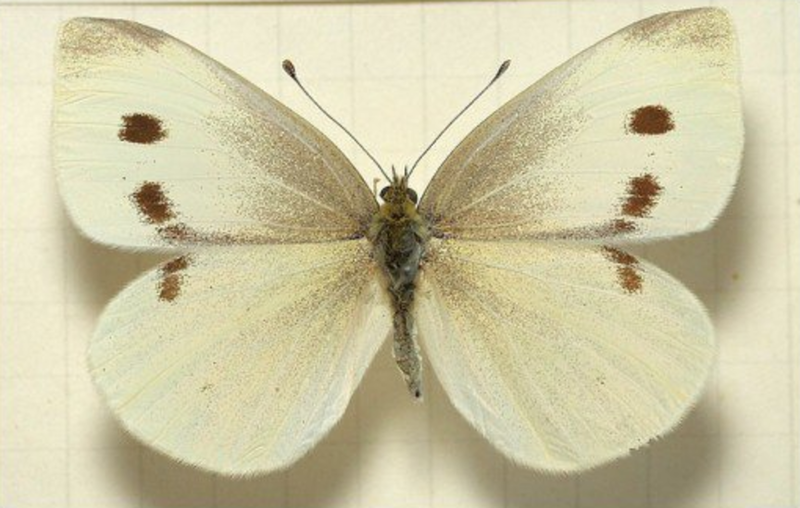 In a way, it's the moth counterpart of the cabbage butterfly. 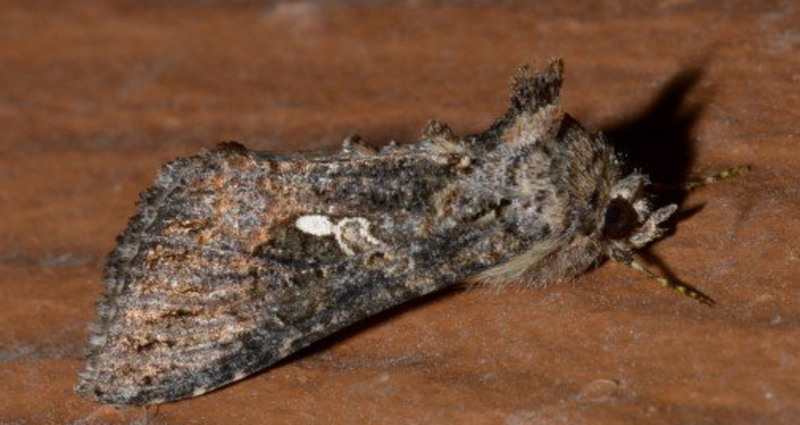 The cabbage looper, or Trichoplusia ni, is common in Eurasia and North America. 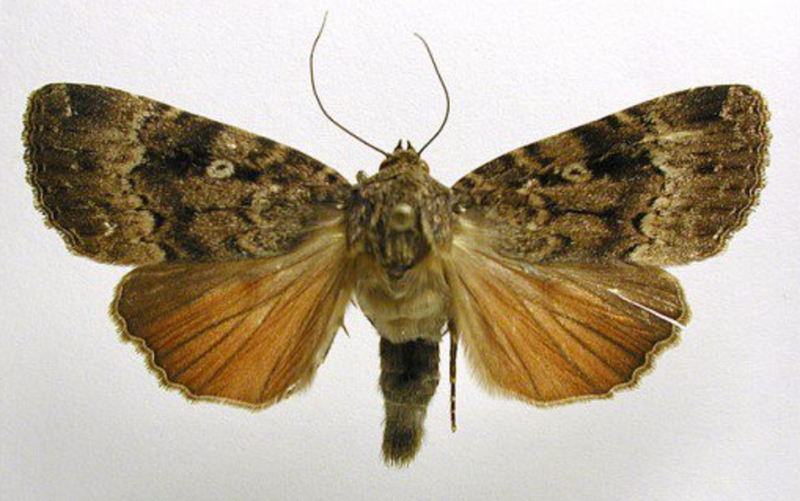 The adult moth is migratory, moving across large distances when the population expands. 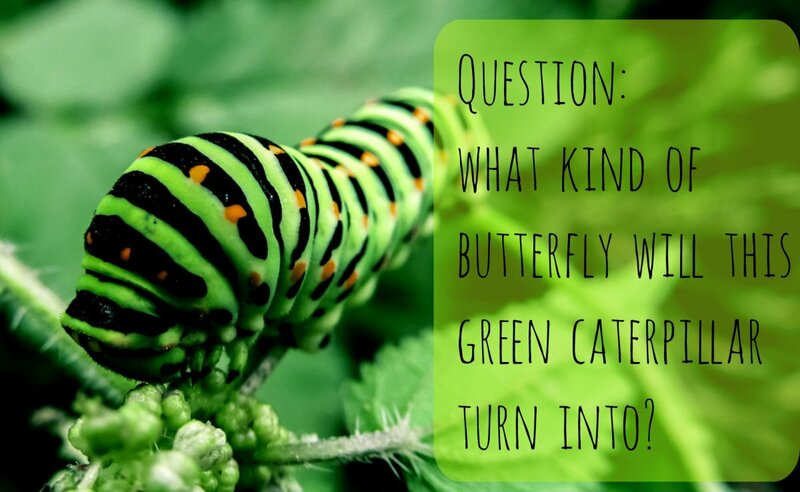 The caterpillar is green and chubby and can be found in the crowns of broccoli and in the inner leaves of cabbage. If you find them, pick them off. Pesticides don't work well with species like this. Will it seriously damage plants or trees? Yes, this species almost anything. This is a very common insect, with many similar species occurring throughout the world. 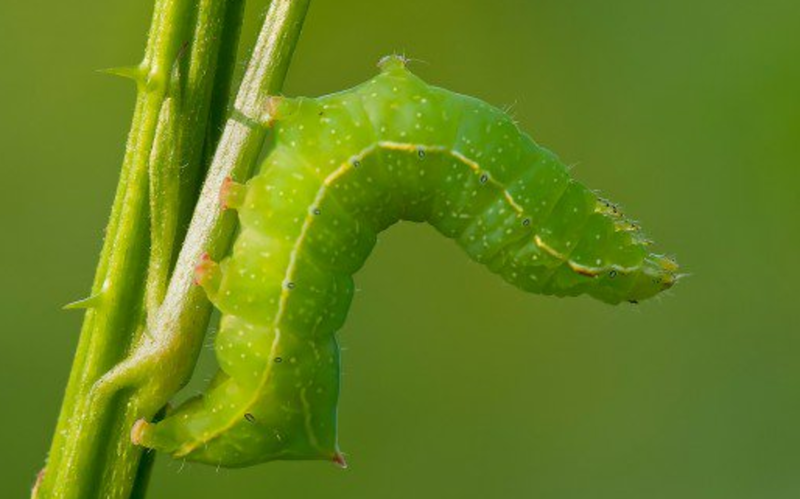 The caterpillar is one of the "cutworms," so-called because they have a habit of attacking plants at ground level, eating through the stem and literally "cutting down" the plant. They can be a serious pest in some situations, and sometimes show up in large numbers, decimating entire crops. 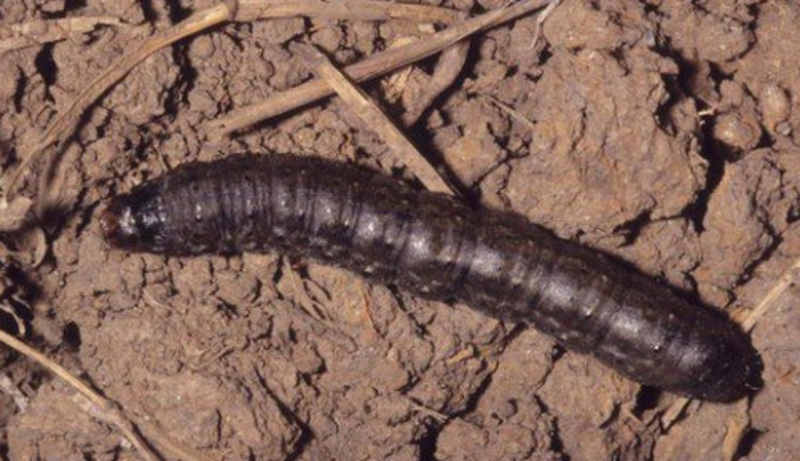 Gardeners sometimes find them when they're digging in soil, where the cutworms hide during the day. 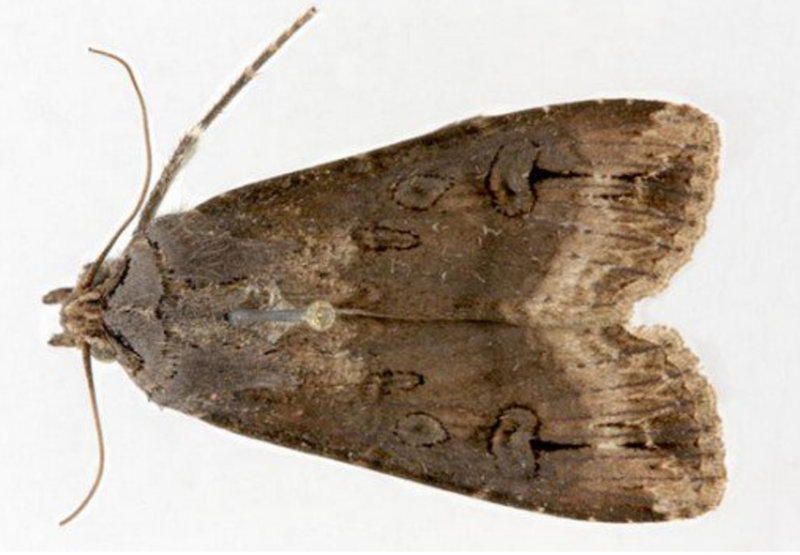 The moths of this group are generally brown or gray, and even experts sometimes have difficulty telling them apart. 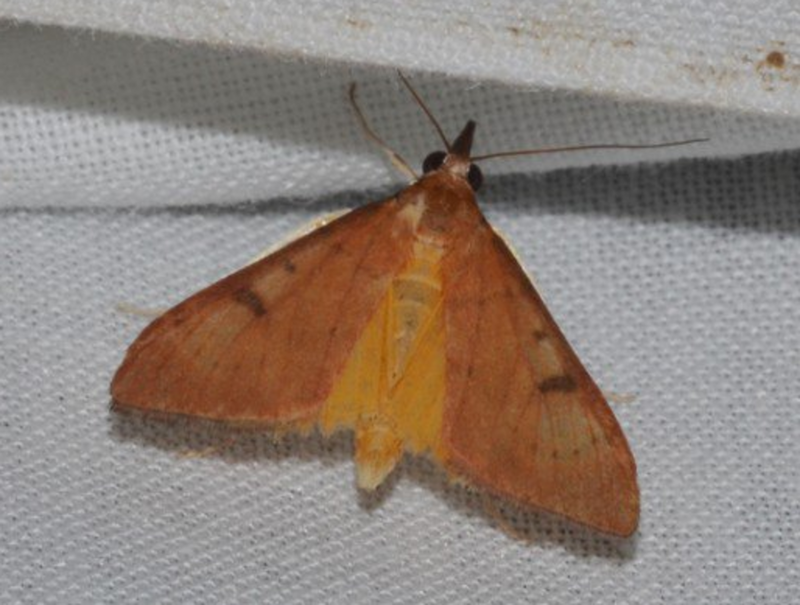 They come to lights at night, and are often referred to as "miller moths" because they mill around the light. This species is not common, but can be found in the right place and time -- generally across the northern states, Canada, and into the western mountain ranges. 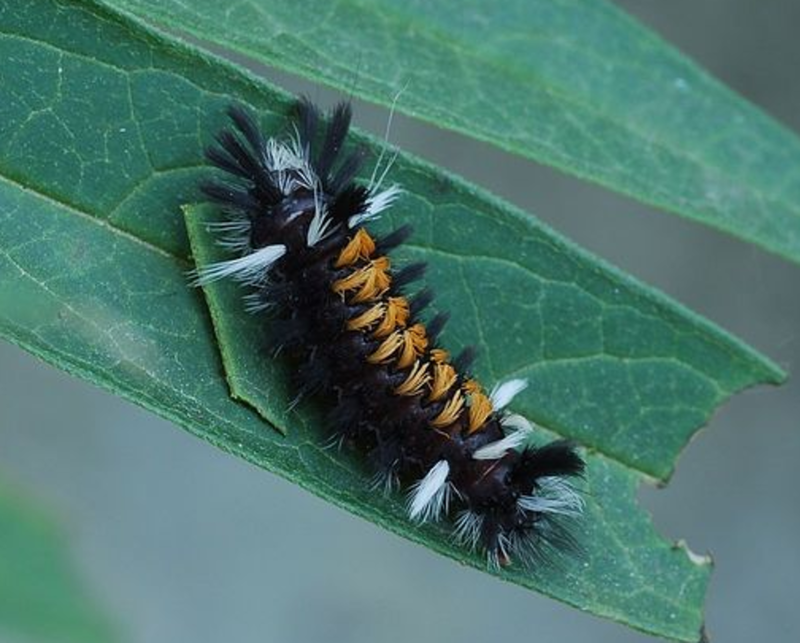 The caterpillar is not all black, like many in this guide, but has orange and often gray hairs in addition to the black ground color. 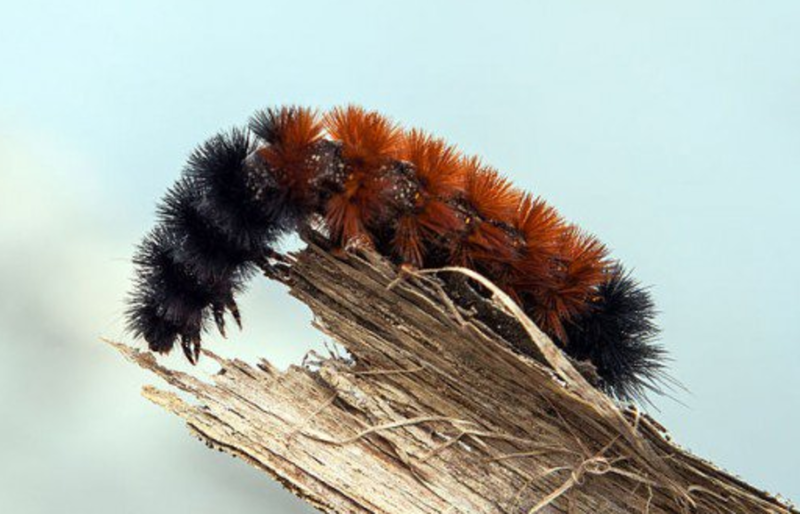 This caterpillar is closely related to the common "woolly bear," which is black on the ends with red in the middle and is often found crawling across roads in late summer. The adult moth of Arctia caja is large and truly beautiful, with vibrant orange-red hindwings spotted with deep blue-black. 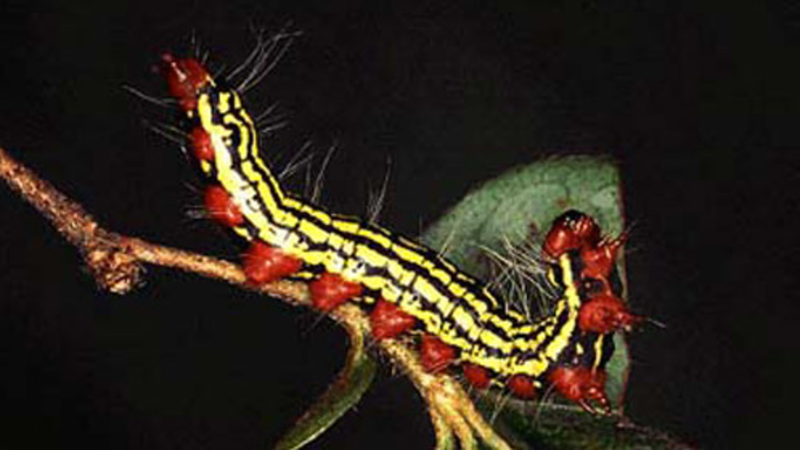 The azalea caterpillar feeds on azaleas, naturally, and it can show up in numbers and do serious damage. 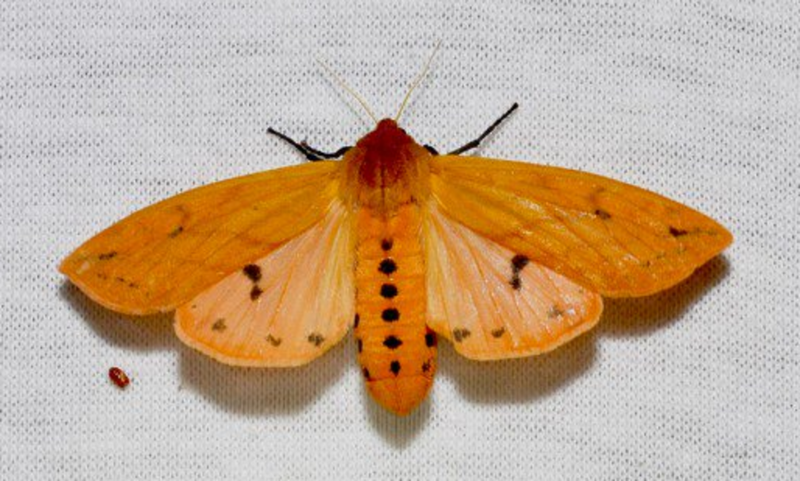 It's one of a group of moths in the genus Datana, and they are typically group-feeders. If a gang of Datana caterpillars select your plant or tree as a food source, then you're in for a battle. 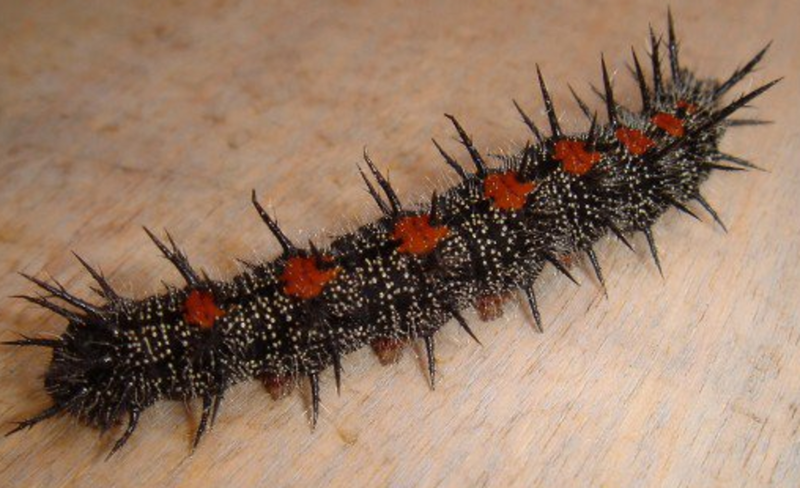 The caterpillars are somewhat variable, and often have more black than the one pictured. 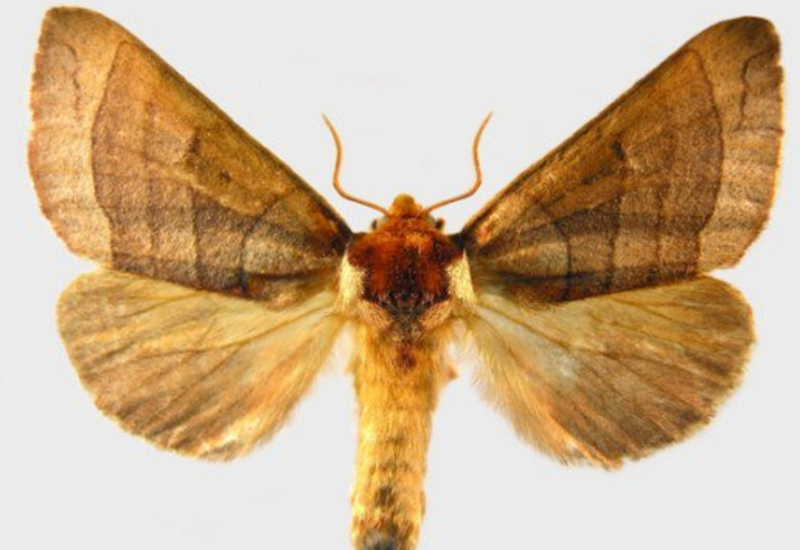 The adult moth is a handsome soft brown with a furry, rust-colored "collar," but that's small consolation for the gardener who comes out to discover his prize azaleas under siege from an army of Datana larvae. This cool caterpillar is always found on some species of milkweed (Asclepias species). They aren't too hard to spot, with their bright stripes of black, white, and yellow. 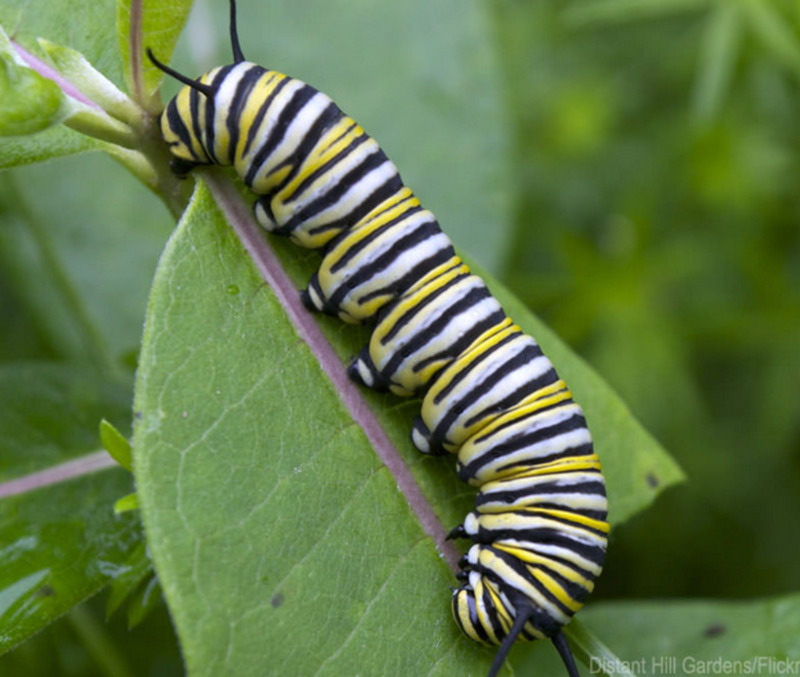 The milkweed that monarchs feed on is protected by having poisonous sap, which in turn makes the monarch caterpillar poisonous to any potential predators. Not a bad form of protection! 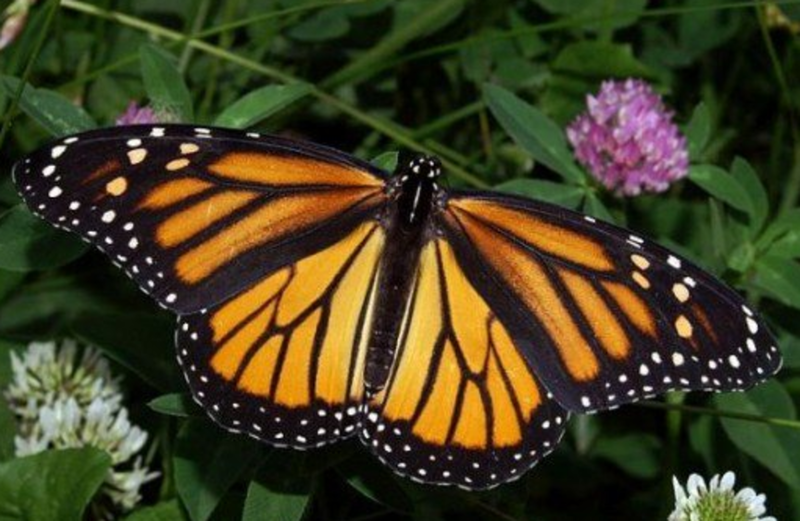 They are brightly colored and turn into one of the most beautiful and popular of all butterflies: the monarch. Check it out, below! Will it seriously damage plants or trees? No -- milkweed is a common roadside plant. Is it rare? No, although pesticide run-off is threatening its foodplant! What does it turn into? The beautiful monarch butterfly. Can you raise it to an adult? Yes, it does well in captivity.